Declining sea ice alters water column properties and the availability of light and nutrients that support productivity. How will reduction in sea ice change ocean mixing and the amount of light that reaches the surface ocean? How does this alter the timing and rates of phytoplankton growth and the supply of food to pelagic and seabed communities? Arctic PRIZE aims to understand how seasonality, ice cover and ocean properties determine the large-scale ecosystem structure of the Arctic Ocean. This will allow the development of predictive tools to assess how Arctic ecosystems will respond to a reducing sea ice cover. 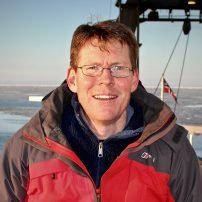 Finlo Cottier is a Senior Lecturer in Polar Oceanography at the Scottish Association for Marine Science (SAMS), based in Oban on the Scottish West Coast. He heads the “Marine Science with Arctic Studies” degree programme run jointly by SAMS and the University of the Highlands and Islands.